Building your dream bedroom suite starts with a bed that you can use as the centerpiece and inspiration for your entire decor. The smooth, clean curves and long, solid panels that accentuate the natural beauty of the solid hardwood in our Amish Redmond Wellington Sleigh Bed make it the perfect piece to start with! Made by hand, this Sleigh Bed is a true example of fine Amish Hardwood Furniture. We offer our Redmond Wellington Bed in all standard sizes, from California King all the way down to a Twin, so we can be sure you'll have the perfect size to fit your unique space. Pick the perfect North American Hardwood and adorn it with your favorite finish, for the perfect bed to incorporate into your decor. Include the optional match under-bed storage units for a handy way to store linens, bedding and any other bedside items right where you need them. Please call one of our Amish Furniture Aficionados today with your questions or to start your order by phone. We offer stain samples with all of our furniture, so you can match your existing pieces or take the time to decide on your favorite combination. Floor to Bottom of Side Rails: 9 1/2"
The standard construction of this bed requires a mattress and box spring. 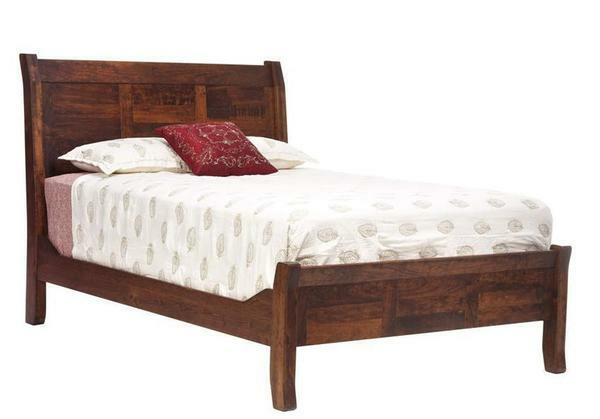 As an option, you can have this bed constructed with a platform above the slat system to be used with a mattress only.